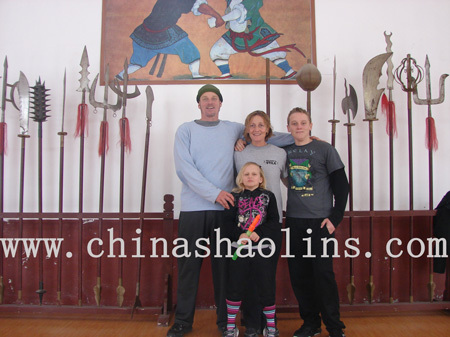 We stayed kunyu mountain shaolin kung fu school to learn kung fu for one month .shaolin kung fu training here was great! Shaolin kung fu Master did a great job. He knows when to push you harder and what you are capable of.Being in class with Isabella(daughter-eight years old) was sometimes difficult. Next time I would probably ask to be in a different group with her. Translators were very friendly and do a great job of remembering everyone’s names!It takes a little while to get used to daily life. People stay in their rooms so more watching in the tv room might make it more popular and therefore easier to get to know each other. Beautiful school surroundings.Just when we’re getting comfortable, we have to leave! Shame! For city Yantai,Nice enough city. Great markets. The kung fu training is wonderful and helped me a lot. My master is great, very nice and taught me a lot. Translators are very good.Daily life is grate and surroundings are beautiful.Yantai city is very clean. Isabella-eight years old :I liked power stretching. Master was nice. The translators were all nice.Daily life and surroundings of the school was good. Mantis group was amazing! my master was a patient and stead fast teacher. He made sure to come to every student and give plenty of attention to each person. He was detailed in his explanation of technique, form and application. Even though his power training /conditioning class was hard, I came out feeling stronger and more capable at holding my stances in the right place. I loved Tuesdays and Thursdays for the Bagua application and mantis application. Mondays were great for the tough basics and form training. Fridays power stretching was the hardest but most fulfilling day. Qu Shifu made sure to come around to every student and stretch each person. He was quite to answer any questions and answer them completely. I enjoyed all the translators, they were all well in English.It will be best if they can speak more louder during the kung fu training. The daily life here was beautiful. I loved walking to temple just above the academy, down the road to the base of Kunyu mountains and even to the temple about a mile from the academy. The academy was nice, clean and well furnished. The food was good and there was always plenty. Master is a knowledgeable master of Bagua and was alike to explain techniques and requirements clearly. He was able to point the shortcomings and weakness in my execution of movements and suggested ways to improve. I have benefited a lot in the two months of training under him and hopefully there will be future opportunities to train with him again. The school has taken reasonable steps to ensure the facilities and meals are enough for the students toward the location of the school is a good balance between convenience and sechistion to avoid distraction. Good place for students who want to learn martial arts in China. 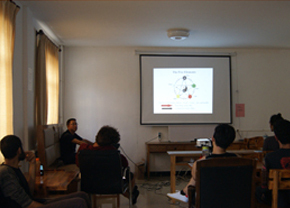 training experiences at kunyu academy. How can I describe my experience here? The greatest training I have ever done. Big thanks to all workers and specially rong shifu. Very nice work to all the translators. Daily life is very nice and perfect. Yantai city, awesome people there and very beautiful place. The training is pretty good and it is easy for me to get used to the environment. My master is very good at leading by example and there was not really a lot of problems regarding communication and translation. The first month was normally hard as it is for adapting. I had very good friends on my second month . The city YANTAI is quite big and good have an taxi to see most of the stuff there. But it is a good place for western things if you really need them. I really enjoyed the training at kunyu mountain school.Welcome introduced to the basis of shaolin in one month and it really gave me a taste of kung fu. I will definitely continue to learn when I back home. -there were a good variety of classes including basis, forms, fitness, flexibility, sanda.master shao was a good teacher, strict but also caring. He was good at pushing students to their potential. regarding the class Tai Chi in the mornings,masters were always changing which made learning the forms not easy to learn,however the Qigong classes were interesting and something I would like to learn more about.-fantastic surroundings with the mountains and national park I really enjoyed staying here. -The city we located is a great place to explore on the weekends and in free time. -the timetable go training has been carefully thought out with a variety of different classes. -rooms are good-choice of food is also good, but maybe have something different other than chips most days. -most of the translators were patient, kind and helpful.some translators still need to improve their English skills. - equipment was sufficient but quite basic old. shaolin kung fu Master – excellent! Translators – different levels of languages skills, so my more friendly, proactive and involved than others; Sara and Jenny were my favorites. Students – My shaolin kung fu group was good, students helpful, friendly and supportive , training was hard have fun with them. Martial arts training was very good and I thoroughly enjoyed learning Martial Arts. Master zhang was absolutely fantastic, his training was the highlight of my time here. 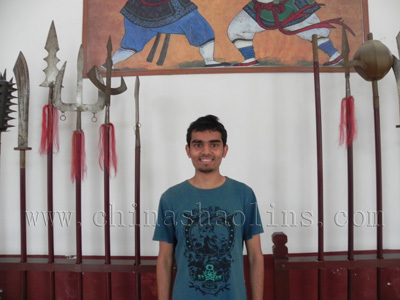 He is very patient, cares immensely for his students and has amazing knowledge of kung fu. I have a deep respect for shifu zhang. I am very graceful for all his help and tuition. The translators were very helpful and friendly, making my time here much more jovial and easier. Without them, the academy would struggle to work. The surrounding landscape is a stunning place to study kung fu. It lives up to my expectation. The food was acceptable but very repetitive, more variety would be welcome by all students. Finally, the internet room needs stricter opening hours. I much prefer yantai city to Beijing and found it a very safe and welcoming place. 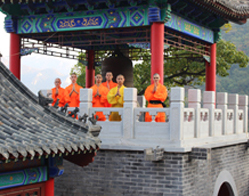 Training at kunyu mountain shaolin kung fu school(www.chinashaolin.com) for the past 8 months has been a very uplifting, eye-opening and necessary step in my life. It has been a great experience to learn kung fu in China and I plan on coming back and training a year or two more. A special thanks to my kung fu master for his patients with training me and a heart well thanks to master Wang for everything he has taught me. Both great masters. A special thanks to translator. Heaven knows she works super hard and she does with a beautiful smile. I had a great time here at the shaolin kung fu school. 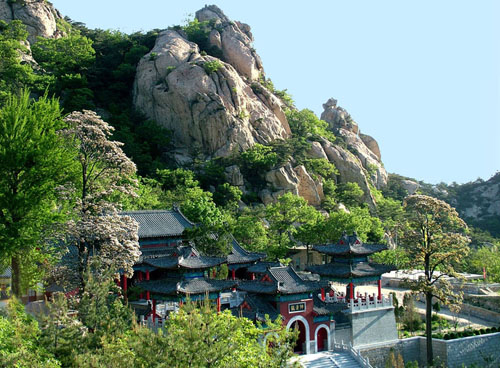 The mountain scenery is incredibly beautiful and gives you that great lives of being in kung fu china.The city of yantai is incredible beautiful at night time with many restaurants to visit and beautiful beaches. Two months Shaolin kung fu training experiences at China kunyu mountain shaolin martial arts academy,I love my master!! !I enjoyed study with him. He pushed us when we needed it, but always in a nice and carrying way. We had a lot of fun as a group. Thanks to him! He knows his things and was always trying to improve me. The translators are very helpful and mostly have a smile on their face. I stayed for two months.Kung fu training here has been very satisfying. It has made me aware of my physical limits. Master Shao has been a great shaolin kung fu teacher, he has been really patient with me and has helped us in all possible ways. I am looking forward to come to this academy because of him. Translators have been usually helpful for helping us, make our life easier. 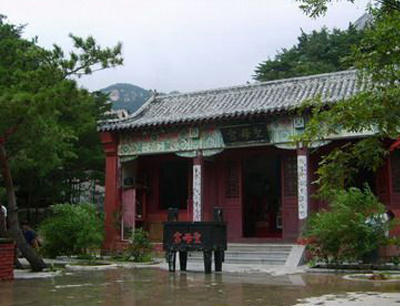 The life in the academy has been really good, the training facility that is provided is also good, the surroundings I think is perfect for shaolin martial arts training, its peaceful, clam and friendly. 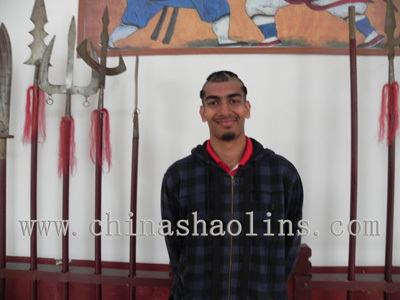 Two months Shaolin kung fu training experiences at China kunyu mountain shaolin kung fu school, I was under master Shao and I think he is really good at pushing you which is what I acquired the most. 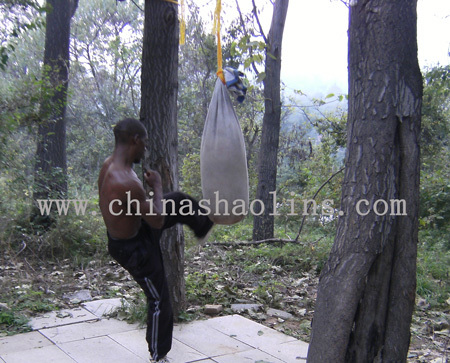 I enjoyed shaolin training under him and have learnt a lot in the two months I have stayed here. The translators also have been very helpful and even though sometimes there might be some communication errors, it’s really nice with them around us without them it would be really tough. In the end, I would really love to come back here and train more and stay longer. The daily life is very relaxed and the training with mountains all around in a really pleasant and clean place is nice. Every morning in the academy is good(the internet, the hot shower, the rooms and the food ). Yantai city is a really nice city with a lot of good stuff. It’s nice to go there and enjoy some different food maybe once a month. 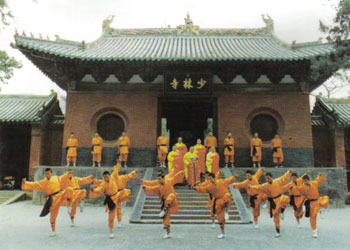 The shaolin training here at kunyu mountain shaolin martial arts academy is well regimented, allowing both mental and physical adaptation to a routine rather quickly. Yet the schedule is subject to a variation upon masters discribion. Each master is incredible in their own way. I fully acknowledge how lucky I am to be surrounding by such skillful good natured masters. As far as my own master，I can not except more from him on both physical and mental. I also feel very lucky I meet four amazing girls: jenny, sara, molly and wendy(English translators). They always make everyone feel happy. The food is really nice. The kitchen workers are very kind. My experience at kunyu kunyu mountain shaolin school. has been everything I has hoping it would be, varied training, beautiful surroundings, and a knowledgeable, skilled, and upstanding master. I have been very happy to train under the construction of Master Qu. He always made sure to see and teach each student in every class and he took us seriously as students. Whether a student was in the group to study for a month or a year, he gave them the same time, instruction, and attention. I have found Master Qu to be a patient, even-tempered, humble person. Someone to be respected both in the area of martial arts and in personal life. As for the translators, they work hard. Some are good( Jenny, Sara, Wendy) which add a hundred fold to the teaching.As for the schools appealing to all the people: young, old, male, female; as a female.The location is excellent. Close enough to the city, but not in it. I enjoy the farm area, the lake, the mountains, perfect. The school itself covers all the necessities.Yantai covers all the needs I could think of, shopping, restaurants, entertainment, relaxation. Great city. Clemement will return in 2013 May to learn for another Two months. My kung fu training programs here..I didn't have any experience in martial arts before I came, but I had dreamed of practising them since I was seven year old. For me,Chinese shaolin kung fu martial arts meant a world of mystic power and wise masters, and I needed to learn from them! I was full of motivation, expectations and ready for hard training. Then, China seems to me the best place to find what I was looking for as it is well known to be the birthplace of martial arts. I wanted to go there to understand more deeper the culture and their way of teaching Kung Fu.Moreover, I was looking for a place where I could live and train everyday seriously in China. 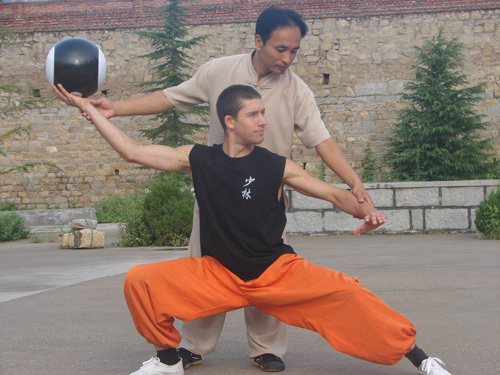 My training in Kunyu mountain mountain Shaolin Kung Fu school definitively make me stronger and more flexible. I learnt some good Kung Fu and improve my fighting skills. The practice of martial arts is demanding and intense and to become good at it it requires perseverance, patience and a lot of discipline. I learnt to push my myself and realize that even when I am tired I can always find some energy to keep training. 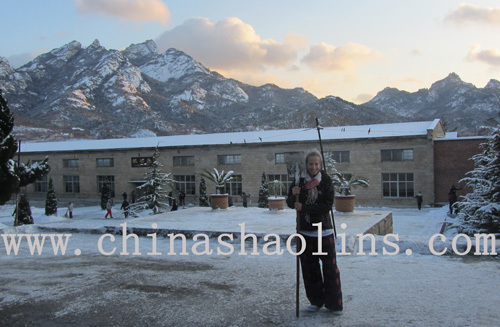 My experience in China and especially in Kunyu mountan school brought me a lot, physically, mentally and spiritually. Living in Kunyu kung fu school was also a good experience to experiment what means community life. I really enjoyed my stay here training with my Master and will carry on training in Kung Fu and teach what he taught me. The school location:Far from the city and its distractions, it provides a pleasant environment in which to focus on kung fu training. The surrounding are beautiful and I am feeling very lucky to had the opportunity to train in such a place. As the city (Yantai)is not far away it is also very convenient. The atmosphere in Kunyu mountain school is geared toward training and all the staff is very helpful. The Masters are very skilled and adapt their training depending on their students physical level. I really recommend to experiment the life and the training here. It is a good opportunity to met people from all over the world and received a high level Kung Fu training.Highly recomend people who want to learn kung fu in China seriously and want to find a best school to learn kung fu! 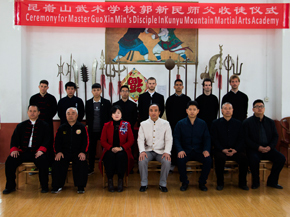 The Training programs in kunyu mountain Shaolin Kung Fu school are very organized. experience a healthier way of life rather than learn martial arts movements or forms. I also wanted to be fitter, to have more coordination and flexibility. I have learned that to live in society require a lot of strength to fight every day temptation. I have become more self disciplined. I have met interesting people from different countries and background. To share a bedroom during a year has taught me to be more respectful My training with Master Guo made me stronger, physically and mentally, and more flexible. 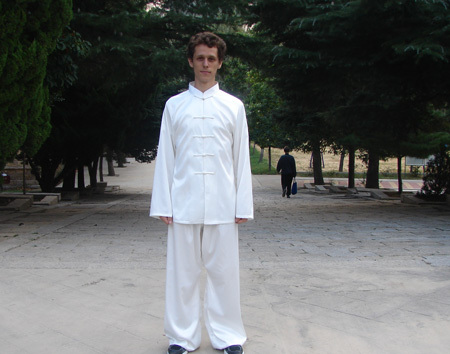 With him, I developed my coordination and my memory of movements I discover infinite possibilities with Qi gong and a way to express myself through Taiji, Baji and Wing chung forms. I have learned some self defense skills. shopping.My master is a really good master, I am also very thankful to the old students who have help me with my learning and keep me motivated. I thank all the staff and the headmaster to give me the opportunity to learn a lot to participate to competitions and to obtain certificates. 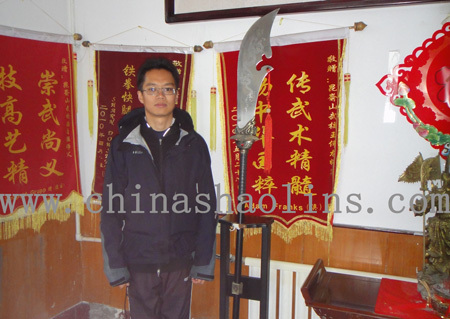 I stayed kunyu mountain shaolin kung fu school to learn kungfu for three months.Shaolin Master here is amazing. He has so much patience(especially with me!!) He is kind and caring and his training is excellent. He makes us learn kung fu very hard so that we learn well. I am honored to be one of his students and I will always remember him and everything he taught me. Wendy, Jenny and Sara are great translators. They have a difficult job but are always happy to help us. The working stuff: chef/ dining ladies/cleaners all do a great job and they work hard to provide a nice living environment. Daily life is perfect!! The schedule allows time for extra personal training. The surroundings are very beautiful and inspiring. The fresh air is so lovely as I living a city normally!! It’s so nice to be in such a beautiful part of China. Yantai is very nice，lots to see and do.Best place to learn kung fu in China. I learn wingchun for six months here.The training is good and Wingchun is a good group( one family) The translating was generally good .They were polite and helpful. Master Guo is an amazing master, he has taught me a lot of stuff both physically and mentally and I feel I have achieved a lot. 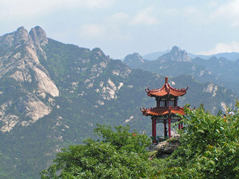 The training experiences of student Charles is from Kunyu mountain . I came to the Academy to live my dream. I studied Chi Kung and Iron Palm with Chi kung Master who is a fantastic teacher and person. I did three things I thought I could never do considering my age of 66. Stood in qigong stance for one hour, broke a brick and did the mountain run every Friday all thanks to my Master.The translators, Sara, Molly, Jennifer and Wendy all worked very hard and were quite helpful. From the time I arrived at the kunyu Academy everyone made me feel welcome and relaxed. Meeting and training with people from all over the world was a unique and unforgettable experience which I fully enjoyed. The meals were looked forward to every day and the surrounding countryside was peaceful and tranquil. Yantai is a beautiful city with great restaurants and shopping. 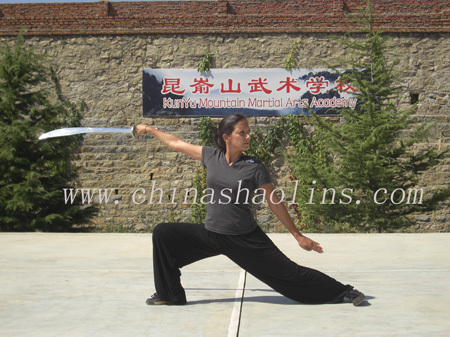 The Academy is a great place for anybody seriously interested in the Chinese martial arts. Muster here is a true professional, very observant, attentive and infinitely patient with all his students. The translators have also been so helpful and many times go beyond their duty to assist students with more personal matters. For me, it was Muster Guo who made the experience feel authentic. His discipline inspired me to try harder even if I was in pain. And for that, I feel stronger, healthier and reinvigorated. The atmosphere is generally positive. There are students varying in age and from many parts of the world. You can keep to yourself or mix with others quite easily. It is good to see a fair number of students are very focused on training hard and being disciplined which is good to avoid distractions.The life is good here at the academy. Yantai is a lovely city with much history and culture. It provides the students with lots of activities to enjoy during the weekends and is just far enough away to avoid too many distractions.Good place to learn . 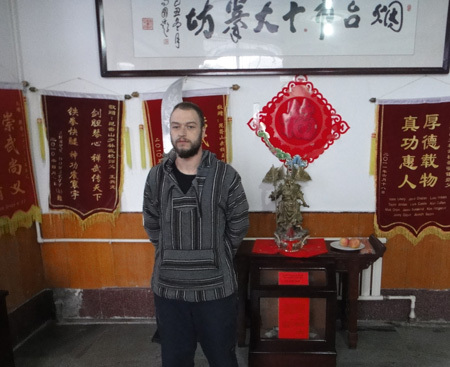 Stay six months to learn Mantis Boxing and Bagua in Kunyu mountain shaolin martial arts academy.The translators here were wonderful, always kind and helpful and they always smiled. My mantis master,Master ,is truly a kind man. Never in my life did. Have so much respect for a person. A great person, master and friend. He is a very caring, peaceful and honorable as well as extremely skilled and just as humble. He is the reason I wish to return to this academy next year. The school is a very peaceful place to live in. clean air, good surroundings for training. Yantai is a beautiful city, very kind people. I have visited the city for many times, and was very enjoyable. Kris will return to learn kung fu for another several months in March 2013. 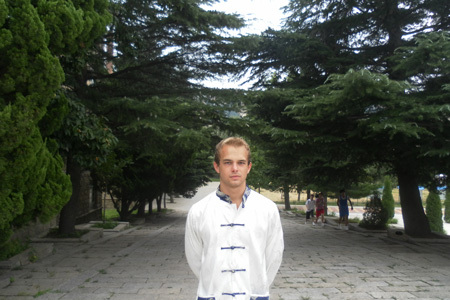 I stayed three months to learn kung fu in China kunyu mountain Shaolin Kung Fu school. The kung fu training is very nice here. Beginners can start on a empty level, experienced students can have a intensive training schedule, so for everybody there is a good balance in training. The shaolin kung fu masters are incredibly skilled and have great patience to teach you every form( with or without a weapon). You desire to learn. The translators are especially patient and always help out whenever you need it. Daily life at the Kunyu school is very calming, hard training, good food and lots of fun with the other students. The surrounding are beautiful. Fields of fruit, followed by the rising of a mountain chain. Yantai City is a booming city where everyone can find whatever he or she needs like clothes or electronic stuff, etc. so party hard and train harder. I spend four months to learn kung fu here. Master: Incredibly capable with excellent ability and attitude,master Shao is a great shaolin master. His weekly syllabus consisted of a healthy balance between basics forms, applications, Sanda, fitness and flexibility. He taught new techniques with patience and great attention to detail, giving me the best chance of getting it right! Both in and outside the training hall, he was approachable, willing to help out with any questions regarding either training or general life in the academy. Translator：They have been incredibly helpful in all aspects of Kunyu mountain school, friendly and able to convey with a technical understanding (in the more experienced translators cases) from master to student, they were also usually willing to assist in all areas of life. Daily life and surroundings: the academy grounds provided everything I needed to train, practice or just chill out, with the surrounding mountains providing the perfect place for time to myself to leanr shaolin kung fu. The atmosphere here was one of the friendliest I’ve ever experienced, filled with good people. Yantai City: It had all I needed with regards to necessary shopping, with expense depending on location. It provided an adequate distraction from the academy, when preceded with plenty of good restaurants as well as the option of relaxing at the bathhouse. 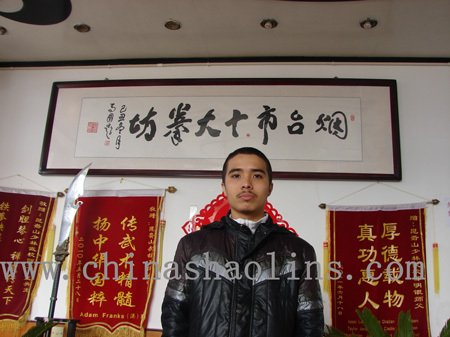 I stayed three months to learn kung fu in kunyu mountain Shaolin school. My master is an excellent teacher. I have had 6 masters at home in Canada but master shao is by far the best teacher I have studied under. He is a kind person and fun teacher but is serious when needed. It was a great honor and privilege to train under such a great Shaolin master. The translators were very good as well especially Jenny and Wendy they were very helpful and I learnt a lot from them. Kunyu school located in very nice surroundings and beautiful mountains. It is also nice to be close to the temple. 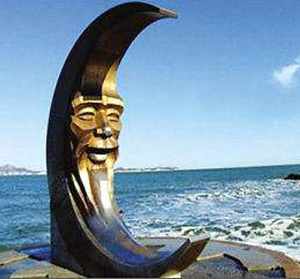 Yantai is a nice city to visit, good food and nice beaches, very friendly tourist.